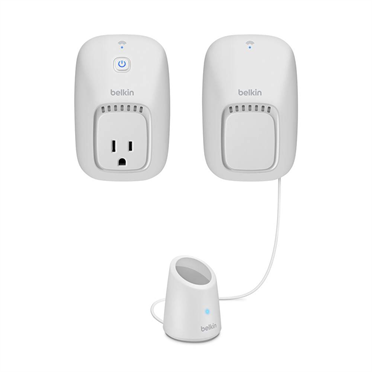 Belkin offers WiFi enabled power switch and motion sensor for less than $80 http://www.belkin.com/. They connect with home WiFi network and are visible on LAN. Furthermore, they use the UPnP (Universal Plug and Play) protocol which details are easy to find with a Google search. At this moment UPnP protocol is not directly available within Openremote therefore for this integration I’ve used the Shell execution protocol to run curl in order to turn the switch position and also to sensor motion and switch state. It is possible to switch the socket through generic TCP/IP protocol, however reading back a status is unreliable. This is due to the fact that the reply is frequently split into 2 TCP/IP messages, the first part with an HTTP UPnP header and the second one with the message body itself. The TCP/IP implementation in Openremote receives only the first packet frequently missing the second part with an actual status. Nevertheless, it works good with the Shell execution protocol with the only disadvantage that a caution must be taken when porting this code on a different platform. For this integration example I’ve used the professional OpenRemote eBox which is running the Linux Voyage OS. I assume that WeMo switches are already connected with the home WiFi LAN which is achieved by following the standard installation procedure as provided by Belkin. Next I’ve used Android Fing app to scan my network and discover WeMo IP addresses which will be needed when configuring Openremote commands. 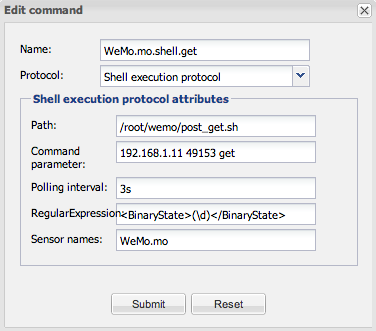 Apparently WeMo devices’ ethernet address starts with EC:1A:59 and this information simplifies locating them within a crowded LAN environment like mine is. 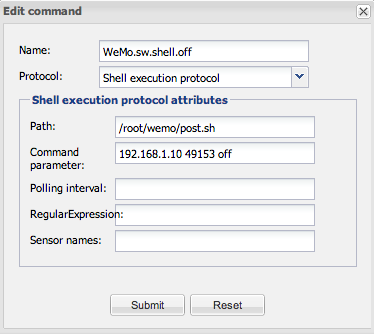 After discovering the IP addresses of WeMo devices please use the following steps to use them in the Openremote designer. 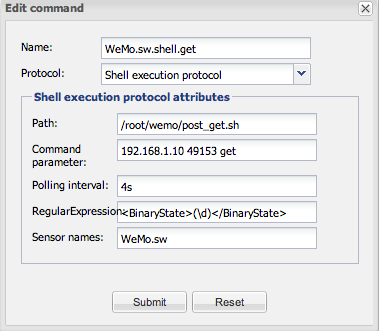 For my integration I’ve put these files in /root/wemo directory on my eBox. For doing this you need to use ssh login. Of course you can place these files in any desired location as long as you adjust parameters of the Shell execution command. As you can see my WeMo devices are at IP addresses 192.168.1.10 (switch) and 192.168.1.11 (motion). Now WeMo devices should be available in the Openremote designer.